Motorists face severe congestion on some routes this weekend as the summer getaway begins on "frantic Friday", a motoring firm has warned. More than nine million people are expected to embark on leisure trips by car between Friday and Sunday as school holidays begin in England and Wales, the RAC said. Getaway traffic will peak on Friday as 3.8 million motorists who are making day trips or driving to holiday destinations battle for road space with regular commuter traffic. Transport data firm Inrix warned that some routes, particularly those popular with holidaymakers, will experience lengthy delays compared with a normal Friday. Those heading south on the M5 between Gloucester and Devon should expect hold-ups of about an hour and a quarter, while westbound journeys on the A303 between the M3 in Hampshire and A37 in Somerset could take an extra hour. A single breakdown or collision could easily extend these delays. The Met Office anticipates that temperatures will climb towards the weekend, reaching 30C in some locations. This could see a rise in the number of people taking spontaneous domestic breaks. An estimated 34 million leisure journeys by car will take place over the next fortnight. Drivers are advised to try to leave early in the morning or in the evening to avoid the busiest period in the middle of the day. 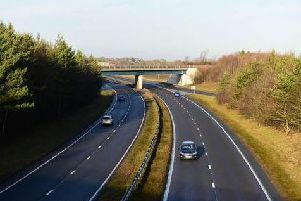 RAC traffic spokesman Rod Dennis said: "This weekend tends to be one of the busiest on the roads for leisure journeys, second only to Easter and Christmas. "On some popular routes this may well mean gridlock, especially through the second half of Friday, when commuters and holidaymakers will be sharing space on the same stretches of the UK's roads. "As a result, it will almost certainly feel like a frantic Friday for some." Inrix data scientist Joshua Kidd said: "The shortest routes to popular holiday destinations may not be the quickest. "Drivers should ensure they check live traffic reports before setting off and consider using alternative routes to avoid the worst of the congestion."